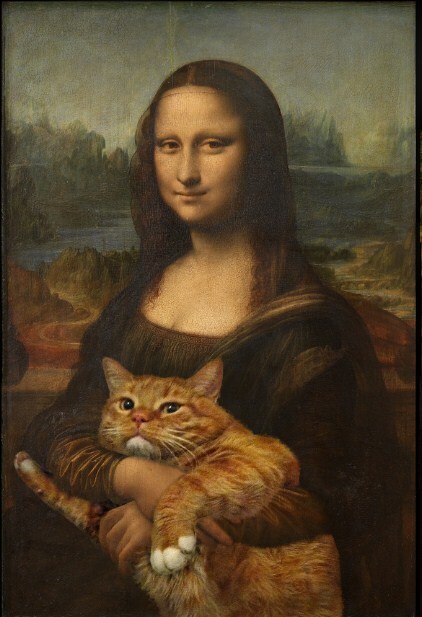 "Leonardo da Vinci, Mona Lisa, True Version"
Have you ever imagined the Mona Lisa to be a cat person? Russian artist Svetlana Petrova, who rose to fame after inserting photographs of her ginger cat in many a world-renowned painting, probably did. This now-famous image of the artist’s now-famous tabby on the enigma’s lap became an Internet sensation last year and went on to catch the eyes of several British and American newspapers. 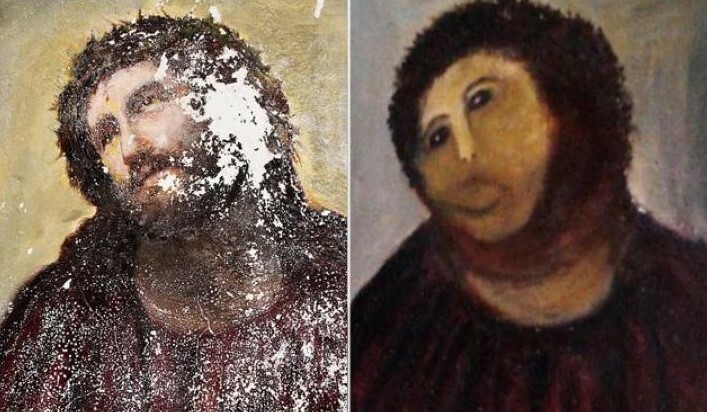 Though purists will dismiss this as Photoshopping, which they fervently argue is not art – others will uphold it as ‘Internet art’, which may use a search engine, social networking website or cutting-edge tech innovations (like 3D printers) as tools. 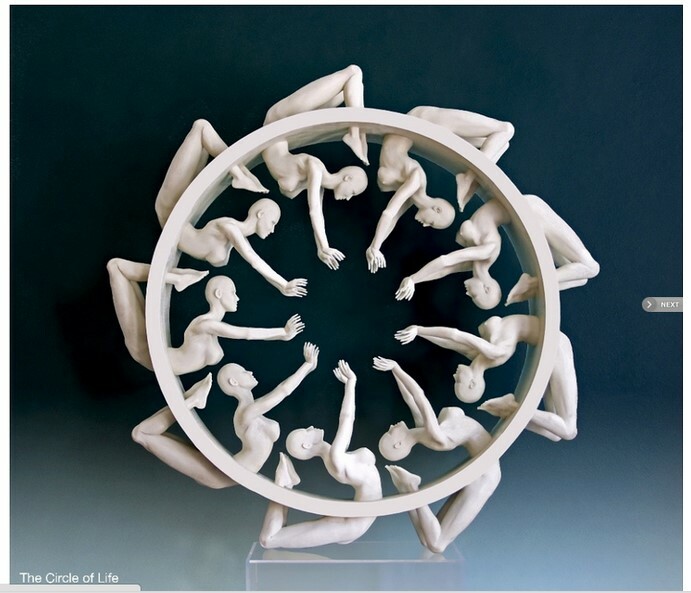 The figures were 3D printed in glass powder and resin and joined together. This form of art, disseminated wholly, and solely, through the World Wide Web (even YouTube videos could fall under its purview) provides a new breed of artists with the ability to produce a whole gamut of original work for an audience that is no longer a niche community, all the while pushing the boundaries and functions of what we traditionally know as ‘art’. And yet, quality may be overshadowed by quantity, as in this space critics, curators and gallery owners have less of a say compared to the artists themselves, including the way the art is distributed. It remains important in its sheer ability to be time-sensitive and in most cases decommodified (you don’t have to pay to enter a website unlike a museum). Not to mention, geographical obstacles are rendered irrelevant as long as you have a computer that is hooked up to the Internet! For example, Miranda July’s project We Think Alone centred around the artist sending e-mails, chosen at random but pertaining to particular themes (like ‘money’ or ‘advice’), of a participating group of celebrities (including Kirsten Dunst and Lena Dunham) to anyone who had clicked on the ‘subscribe’ button, on a weekly basis. Memes, too, are considered modern pop art by many, as are viral videos like Psy’s Gangnam Style (which heaps of people interpreted in a political or social context), where popularity is measured in terms of the number of hits. Italian news website fanpage.it’s 2014 Slap Her video, which forced viewers to look at violence against women through children’s POVs, has generated 30,187,872 hits till now (below). All this, even as the longstanding debate – whether anything outside the fine or performance arts does actually constitute art – continues to rage. But then, we do live in an age where the lines are constantly blurring, where an unconventional literary subculture like fan fiction is hailed as literature by some, and DJ’ing and video games are considered art forms by many others. Leaving a lasting impression is Indian artist Shilpa Gupta’s satirical project blessed-bandwidth.net, which was commissioned by Tate Online in the early years of the millennium (below). It invited visitors to log on and get ‘blessed’. For this, she compiled photographs and videos of her visits to various places of worship to have a network cable blessed. Gupta’s work has sparked much debate and discussion about religion in the real world – fulfilling the purpose of the work splendidly. And in the way of being the ultimate leveller, anyone can be an Internet artist. After all, these days, it is the likes of Vimeo and social media and smartphones that are grabbing all the eyeballs. Even in museums.